Mention the words ‘chocolate’ and ‘mousse’ and three distinct childhood memories immediately spring to my mind. First up is that of eating little plastic pots of the stuff after the occasional mid-week meal. Nowadays I’m pretty scornful of these foamy excuses for mousses (think ingredients including reduced fat cocoa, skimmed milk, gelatine and some sort of starch), but then they were something of a childhood treat and certainly a step up from Petit Filous in the excitement stakes (chocolate; not yoghurt!). I can clearly remember the satisfying ritual of peeling back and licking the lid, scraping out each mouthful with a tiny teaspoon and trying to make my mousse last longer than my brother’s without him trying to steal any as I ate. Second is the chocolate mousse they used to serve at our favourite local Italian. An old school family-run restaurant situated in what felt like the ground floor of a London townhouse – our usual table affording us children a sneaky peek into their bustling shoebox of a kitchen – this is a place where my (far less adventurous than now) littler loaf menu choice was almost always the same. To start, I’d eat mozzarella in carozza – literal meaning: ‘in a carriage’ – crunchy deep-fried crumbs surrounding melting mozzarella cheese and served alongside a silver gravy boat of spicy tomato sauce. My main course was always a plate of homemade pasta with butter and parmesan (the fussy child’s option and a staple of my childhood holidays in Italy between the ages of about five and fifteen), accompanied by a salad or plate of mixed grilled vegetables. For pudding, I’d never think to order anything but that incredible chocolate mousse, light with bubbles and rich with butter, served in a deep white dish that seemed to be all but bottomless. My third, and favourite, memory, is that of my Mum’s chocolate mousse. Infinitely superior to those shop-bought pots and perhaps a little less indulgent than that buttery restaurant version, I remember her recipe involving double boilers, plenty of patience, a lot of whisking and a shot of coffee. Served in little white ramekins with a blob of cream on top (or shaving foam from a can when I was a certain age and insisted that squirty cream was the absolute height of edible sophistication), this delicious mousse was made only on rare occasions and enjoyed all the more because of it. The recipe I’m sharing today isn’t anything wildly new. It’s not a vegan version made from tofu or avocado (silken tofu I’ve tried, it’s nice but I’m still not convinced that I’d call it a mousse), coconut milk whipped into amazing moussy heaven or a miracle mixture of just water and chocolate. It is, however, one of my favourite fall-back recipes, inspired by my Mum, made with ingredients I almost always have on hand and reminiscent of happy childhood days. Like these chocolate frangipane tarts, this recipe is also intended as a springboard from which to try other flavour variations. Omit the coffee and use the same volume of water for a straight-up chocolate mousse, stir in bourbon or rum for an alcoholic kick, add Aperol, orange zest or other fruity flavours and scatter with anything from toasted nuts to dried fruits, chocolate chips, chilli, cardamom and more. Share this recipe with friends and family, enjoy it in its simplicity and hopefully you’ll be making moussy memories for generations to come. 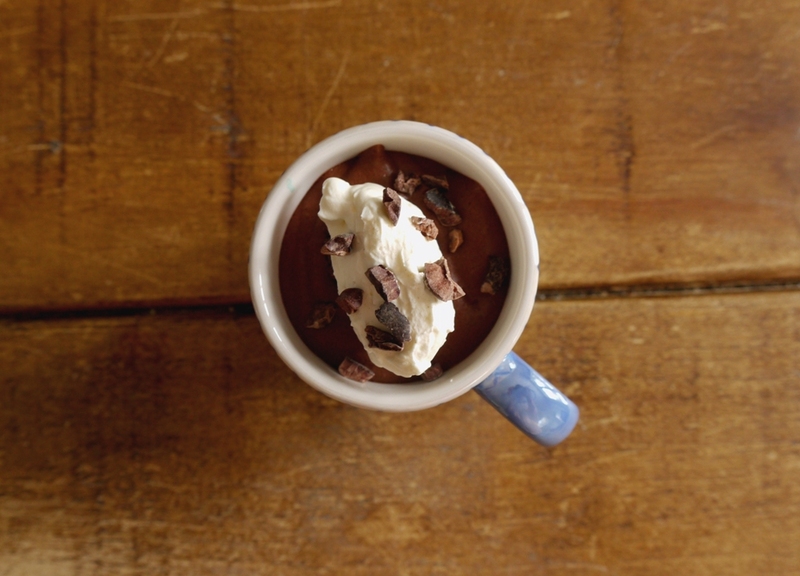 Place the chopped chocolate in a heatproof bowl with the warm coffee and water mixture. Place over a pan of barely simmering water and melt slowly. Remove from the heat and set aside to cool for 2 – 3 minutes. Beat the egg yolks into the melted chocolate then set aside. In a clean, dry bowl, whisk the egg whites until soft peaks form. Adding a little sugar at a time and the pinch of salt, continue to whisk until glossy, stiff peaks form. Using a large metal spoon, gently fold about one quarter of the egg whites into the melted chocolate mixture to loosen it. Tip in the remaining whipped egg whites and gently fold until combined. The more careful you are, the more air will remain in the mixture and the lighter your mousse will be. Divide the mousse between eight little espresso cups or whatever pots/ramekins you are using. Pop in the fridge, covered with cling film, and allow to chill for at least two hours before serving. When ready to serve, remove from the fridge, top with a little whipped cream and sprinkle with cocoa nibs or toasted nuts. Yum, this mousse looks amazing! You can’t beat a classic chocolate mousse – they always remind me of holidays in France where it was inevitably my pudding of choice. This post brought back so many happy memories. Kathryn – ah, memories of mousse are a wonderful thing! Nicky – oh, I’m not a fan of cream in mousse – so much more chocolaty and less cloying without. Oh I do love mousse and it always goes down very well everywhere. These look and sound delicious. I love your stories of chocolate mousse pots and squirty cream! I was exactly the same when I was younger! this recipe looks delicious! Oh, thank you so much for the coffee substitution suggestions. I’m not a coffee drinker and I never know what to substitute. Thanks! YUUUM! 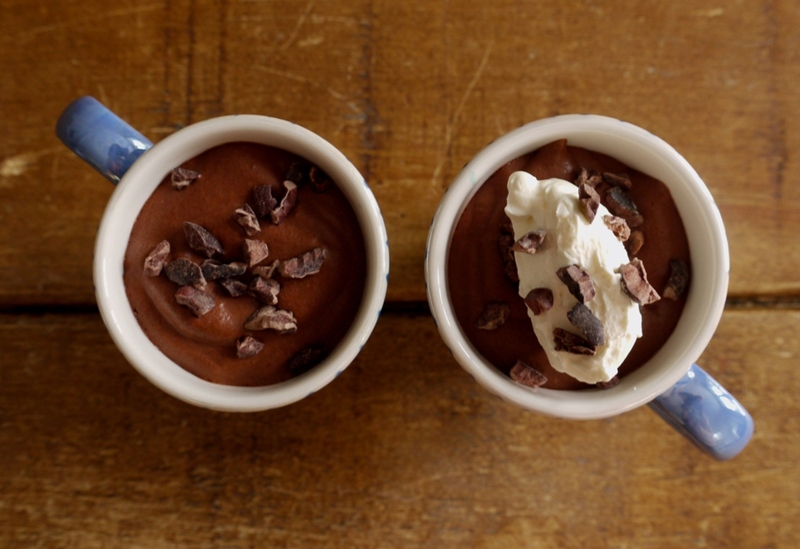 This looks like gorgeous, thick mousse – perfect. I had a similar obsession with chocolate mousse as a child, every year on holiday in France I’d sample each and every version going. Happy times. This looks like the perfect chocolate mousse in my books. Rich, creamy and with a good dose of coffee. Ah, the supermarket ones are pants! All air! Once you stirred the spoon around the pot a few times you’d just end up with a chocolately too-sweet gloop at the bottom! Ohh, can you tell I feel somewhat strongly about chocolate mousse!? Way over on the other extreme, yours look dee-lish! My Kitchen Stories – I sometimes make it without the water/coffee but it is definitely denser and more truffly which isn’t always what you want. Jenny – haha, did you spray it straight from the can into your mouth?! Kirsten – just plain water will still produce a gorgeous mousse, enjoy! Kate – it’s a subject I feel very strongly about too! I don’t have kids, I have no excuse 😉 ok I have a husband who is a big kid. Chocolate mousse is something that will always remain a favourite as it contains so few ingredients but produce something so superb. I love the way you can add different flavours according to your mood. I must get myself some cocoa nibs and am trying to think of a perfect Valentine dessert for my husband as a surprise. He will buy the main course and cook/assemble it & I am happy to do pud. Of course it will be chocolate….but mousse, tart or cake?! Wow, these look great. Love how you’ve presented them. Throwing a dinner party this weekend and these could be just the non nonsense dessert I’m looking for! Thanks for the inspiration. I love your blog! Hmm is that a dig at my choc tofu mousse? 😉 I tried a vegan cake out on friends the other night that said if I hadn’t presented it as ‘cheesecake’ they would have loved it but you raise someones hopes of it being just that when you give it that name.. so when it tastes different, you feel let down. I’m glad you didn’t put cream in your recipe, it doesn’t need it and I love the richness of using only eggs in choc mousse and finishing it with a pillow of soft, cold cream in contrast. These look yummy and the perfect size! Ahem, um, definitely not a dig… 🙂 I think we’re agreed though – the tofu stuff is nice but it’s just not mousse/cheesecake. You’re right about cream – it’s so claggy in mousses, I’m not a fan. Mousse really does bring back memories. It’s one of those old-school classics that never goes out of style and that I eat infrequently enough to appreciate it whenever I get a good one. I also love your adorable serving cups! 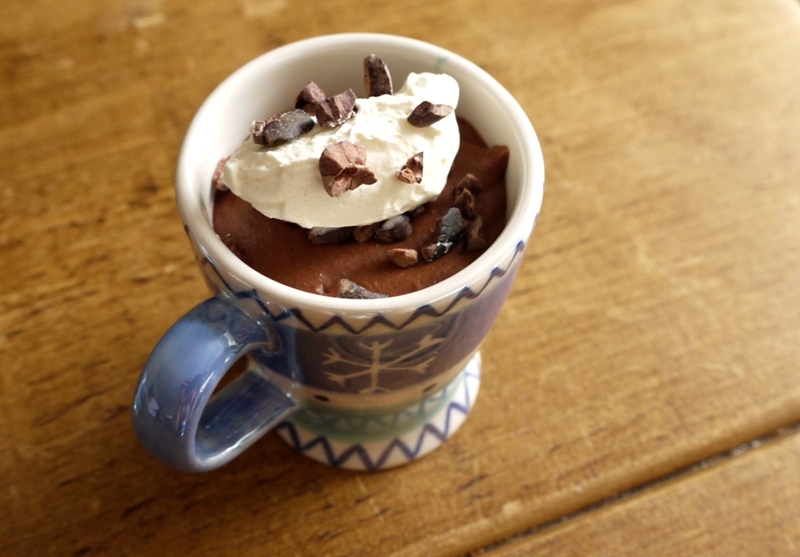 This is the perfect, old-fashion mousse, the coffee makes it a bit better! Chocolate mousse was `the´ restaurant dessert when I was growing up. I was allergic to chocolate as a kid so I was always stuck having petit filous, or Hippo Tots which they banned because they were really bad for you. I too was a very picky eater as a child! 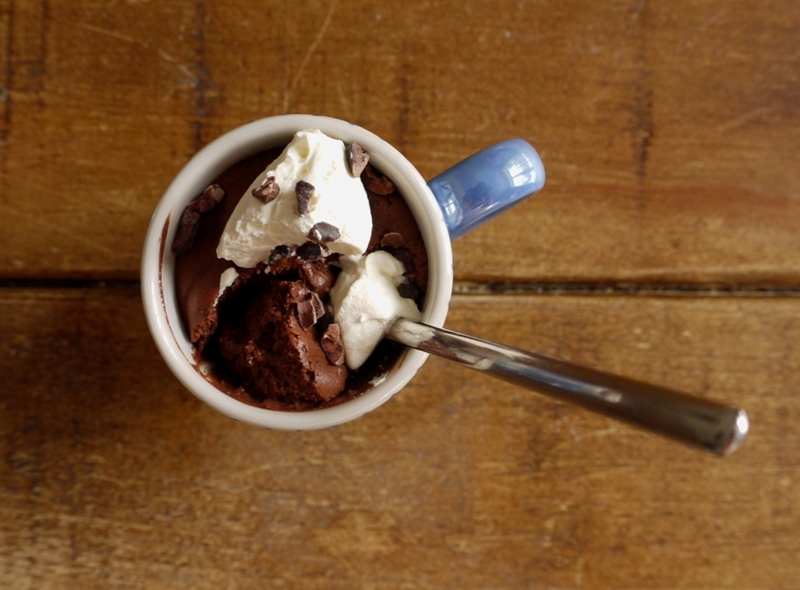 I’ve never made a mousse before but yours sounds delish – I’m getting bored of making crumbles and things now! Paula – a little bit of coffee lifts the chocolate so wonderfully. I love the presentation. The little cups are so cute. I also have very fond childhood memories of chocolate mousse. It wasn’t homemade though! Perfect little sweet treat for after dinner 🙂 and a coffee all rolled in to one. yay, have to try this. Always love a good chocolate mousse. A delicious chocolate mousse recipe is great to have in one’s repertoire, with or without personal variations. Wow these look so cute, in the espresso cups! Love the mix of chocolate and espresso. Oh TLL you are a girl I feel is a kindred spirit. I believe this is the only way to make mousse. It’s how it’s made in France as well. I am a sucker for a good mousse. I also saw, you loved pasta with just butter and parm. This is my absolute fav way to eat pasta. Carb, butter, cheese = perfection. I used to love those plastic pots too. I will have to try your recipe next time I’m making chocolate mousse. My goodness that mousse looks good! So fluffy. I love the cocoa nibs on top too. Can almost taste it. Nuts About Food – agreed! Lemon Cake – coffee always makes things taste that little bit more chocolaty. Jen – haha, great description! Fudging Ahead – and not even that unhealthy. You can make it without the sugar too for a slightly more bitter/sophisticated version. Amanda – I love the contrast of the crunchy nibs against the fluffy, smooth mousse. 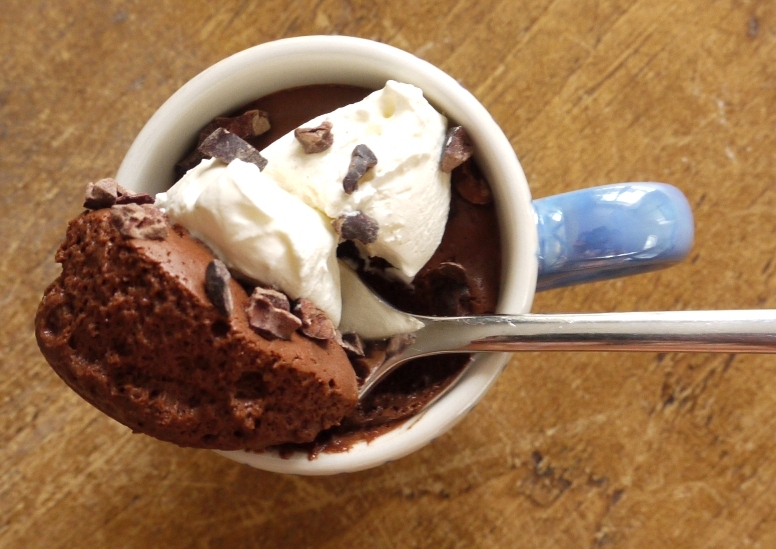 Mousse without whipped cream (actually in the recipe itself) is one of my favorite desserts. I love the pure chocolate flavor that comes through when you use only eggs. 100% agree, it tastes so much more chocolaty and the flavour is so clean. I loved reading your chocolate mousse memories. The one about the Italian restaurant, in particular, made me feel nostalgic – haven’t had a Mozzarella in Carrozza in ages! I know, definitely need some more mozzarella in carozza in my life! Hope you like the mousse – it’s so simple and delicious, I’ve tried lots of other recipes but always fall back to this one. I basically just made this in cake form! Can’t wait to try it in mousse form! Looks amazing!